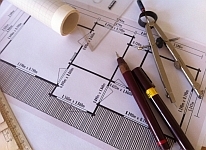 Do I need planning permission for a log cabin? 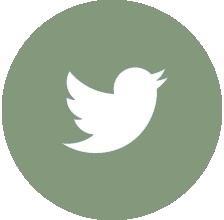 If you follow our planning guide in most cases it should not be necessary. We would still recommend you seek approval from Development Control. 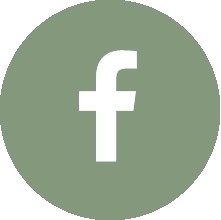 See our planning page. How many electrical points are provided with the installation service? Two double sockets and a consumer unit suitable for both a ring circuit and lighting circuit are provided in the basic installation cost. If you require additional sockets or lighting this can be provided based on a reaonsable hourly rate. Is insulation required on the Brighton as the walls are thicker? The Brighton is by no means our thickest walled cabin. 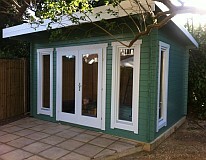 However the key areas to insulate are the roof and floor which account for 70% of heat loss. Roofs can also absorb quite a lot of heat in summer so insulation will maintain a cooler interior in summer. Insulating walls will make a little difference but in most cases plasterboarding is a cosmetic decision or for example as a means of providing a projection wall for a home cinema. The ultimate floor insulation is provided using 50mm Celotex insulation boards with laminate or real wood flooring fitted above. 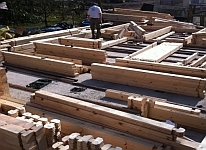 How does the Finnforest insulation kits differ from what you offer? 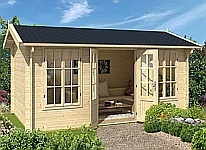 We offer the finnforest installation kits which are only currently available for four cabin types. These kits use tongue and groove across the roof supports and airtec bubble insulation. 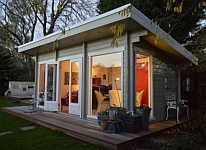 We also offer an alternative for every cabin in our range of 50mm celotex or kingspan insulation and plasterboard on or between the roof supports. 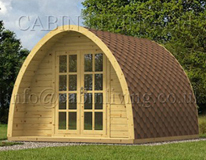 For more detail visit Cabin Insulation in our options section. Can you please give me a price for laminate flooring? Our fitting charge for laminate flooring is £10 per square metre. We have a selection of laminate floors varying from the basic clic range to real wood flooring which can be viewed within our options section. Take me there now. Do you install to areas around London? 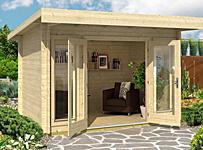 We offer installation services across the UK for the prices quoted next to each log cabin. 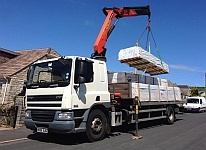 We also offer supply and delivery only for self build or DIY projects. 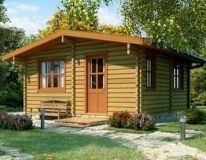 What would be the additional charges for electrical installation of the Suoja log cabin if the cabin is 40-50m from the house's power supply? The additional charge for electrical connection would be £250 for cable. 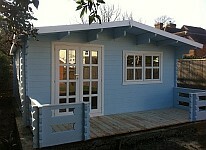 Alternatively £5 per additional metre beyond the inclusive 5 metre cost. The additional cost of trenchwork will depend on the soil type and ease of access. 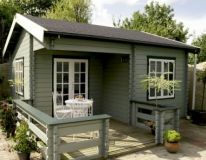 What specification would you recommend for a log cabin where I intend to keep paperwork and my computer? 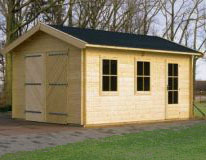 We would recommend log cabins with 44mm walls or more, insulated floor and ceiling and double glazing.